To playback a video click on that videos thumbnail in the content viewer. iSpyConnect plays back your captured videos in full resolution. To do this it pops them up in a dynamic windows. You can view these videos fullscreen by clicking the expand icon in the bottom right corner of the player. If you don't have flash installed iSpy will try to use HTML5. Only some of the newest web browsers currently support HTML5 video. You can also playback captured content locally. Right click on a thumbnail in ispy and select your preferred playback option or see Settings to set a default. Below the video player you'll see controls to upload this video to youtube or to email it to someone. To use this functionality you'll need to have added your YouTube settings into iSpy. Click the link (Public or Private) to initiate the upload. iSpy uploads the file in the background so you don't need to wait for the web browser to do anything. If the file doesn't upload check the log file. iSpy will send you an email with a link to your uploaded video when it's finished uploading. 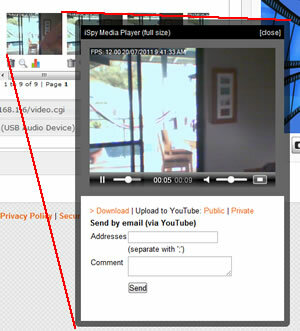 If you email the video to someone else iSpy will upload it as a public video (so they can watch it).